A little over a week ago my husband and I climbed into a sleeper car in Yemassee SC and began our working vacation with a sixteen hour ride to NYC. 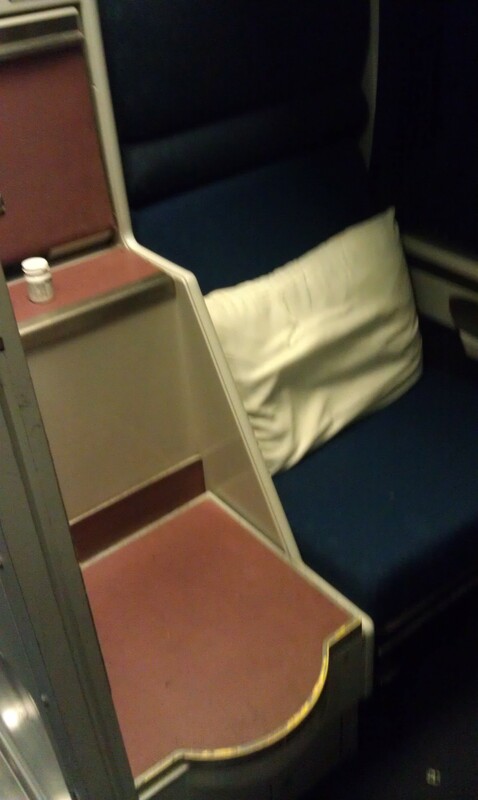 The last time I rode in a sleeper I was a college student in Europe and my car was like a little dorm room. This car was about half of that size, but at least I got to ride for sixteen hours sitting next to a toilet. The trip wasn’t too bad, despite my managing to somehow kick myself in the eye with my own boot. The first thing we did in NYC was go see the play Warhorse, based on the book by the same title, which is published by my publisher, Scholastic. The book is told from the point of view of the horse, but the play is not. It is a very beautiful play with a poignant theme about the costs of war. Life sized horse puppets are used and they were amazing! I enjoyed the show despite my throbbing eye. After a quick dinner we went to another literary play called Seminar. The play is about a writing instructor and the four students he is working with. As a children’s writer, I don’t come up against some of the issues faced by the young writers on stage, but many of the play’s lines rang true — in perfect pitch. Somehow, we ended up on the second row, which was extremely close to the stage. I think I could have stretched out my leg and propped my foot up on it. It was exciting, especially because Jeff Goldblum was the star, and yes, I did stay afterward to meet him! He was nice enough not to mention my bloodshot eye. The next morning, I was thrilled to discover that the Met was hosting an exhibit called The Steins Collect, which features artworks collected by Gertrude Stein and her brothers in the early 1900s. I studied the writing of Gertrude Stein while working on my Masters degree, so I found the exhibit fascinating. 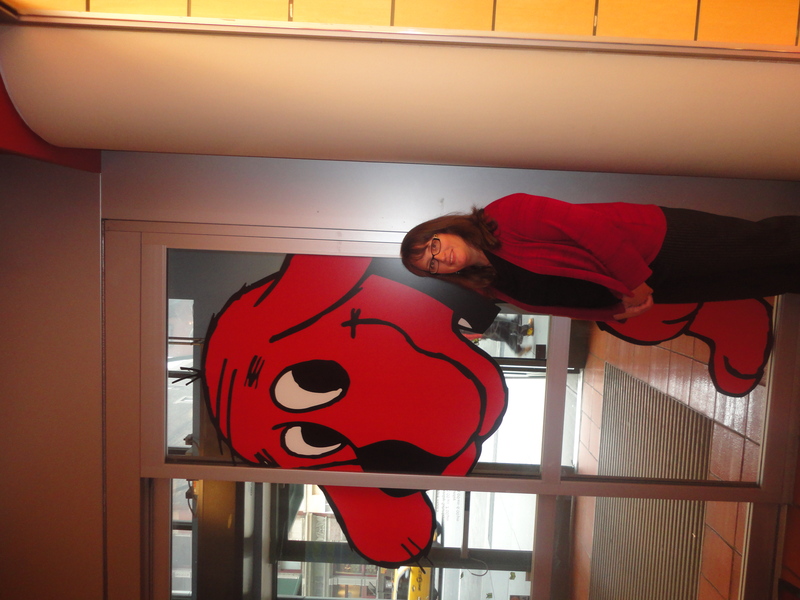 After purchasing redness-reducing eye drops, I headed off to the Scholastic offices to have lunch with editor extraordinaire Aimee Friedman and super publicist Amanda Vega, hoping my eye was not still the shade of Clifford the Big Red dog. We had a great conversation about books, including Maggie Steifvater’s Scorpio Races, which we all agreed was beautifully written. And we talked about The Boy Project too, which we all agree is perfect for middle school girls. The next literary event on the agenda was that evening. 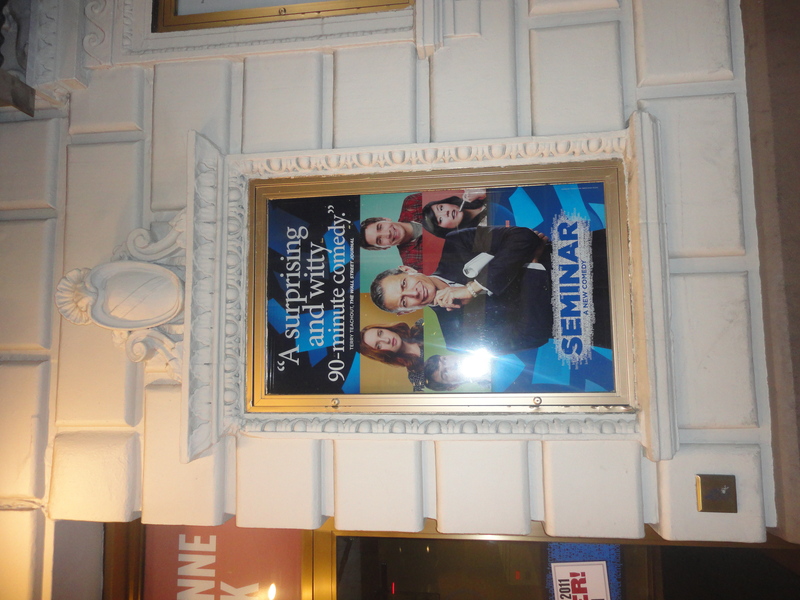 We went to see The Best Man, a play by master writer Gore Vidal. It was super fun to watch the star-studded cast, and yes, we stayed afterward like typical tourists to meet James Earl Jones, Candice Bergman, John Larroquette, and Eric McCormick. Erick McCormick laughed at my joke, which was thrilling, but not as thrilling as looking in the mirror back at the hotel room and realizing the redness in my eye was beginning to fade. The next day took us to Hyde Park where we rode by the one-time home of Eleanor Roosevelt. We dined that night at the Culinary Institute of America – you should go there if you ever get the chance. Thanks to my husband, a future chef now knows what a draft beer is. I know. Classy. I spent the following day at the home of editor Patti Gauch with a group of writers I met during a Highlights Founders Workshop last year. Wonderful Patti invited us up for a reunion, and we were able to share a chapter of our works in progress and troubleshoot. I learned that I need to make my conclusion more active. Patti gave me several ideas about how to do that. Armed with this information, I am prepared to start rewriting! My workshop group with Patti Gauch. When the waiter looked at the picture he took and smiled, I thought it meant it was a good picture. I am the pink dot at the back right. Although I’m not posting until later, I’m writing this during my train ride home, thankful to have this time to reflect on a great trip, and to be looking at my computer through two good, normal-colored eyes. This entry was posted in This Nerdy Chick, Uncategorized and tagged Gertrude Stein, Patti Lee Gauch, Seminar, Sleeper Car, THE BOY PROJECT, The Steins Collect, Warhorse. What a FABULOUS trip Kami! How wonderful to experience such an amazing time in your life with Shannon by your side. 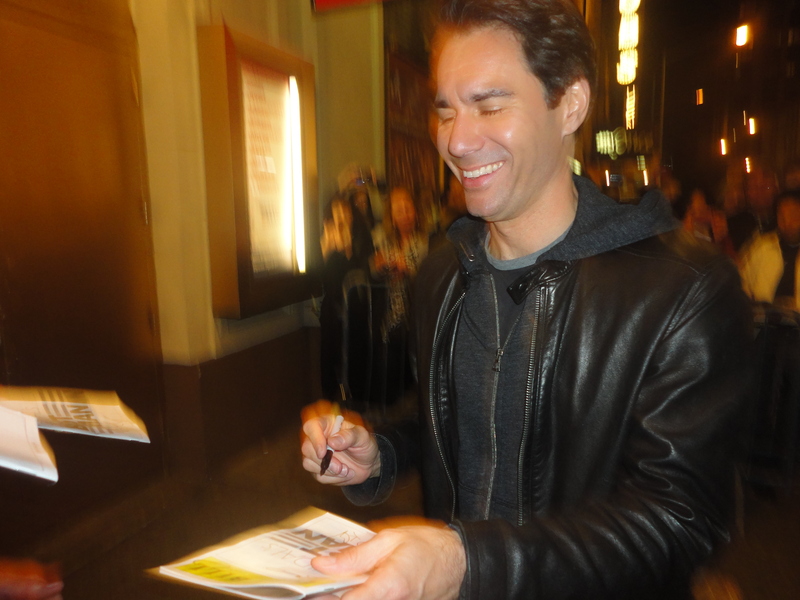 I would have loved to have seen Eric McCormick laugh – of course it has nothing to do with him being so handsome;) Hopefully you will be West Coast bound soon! Sounds like a fantastic trip (well, except for the eye-kicking part)! 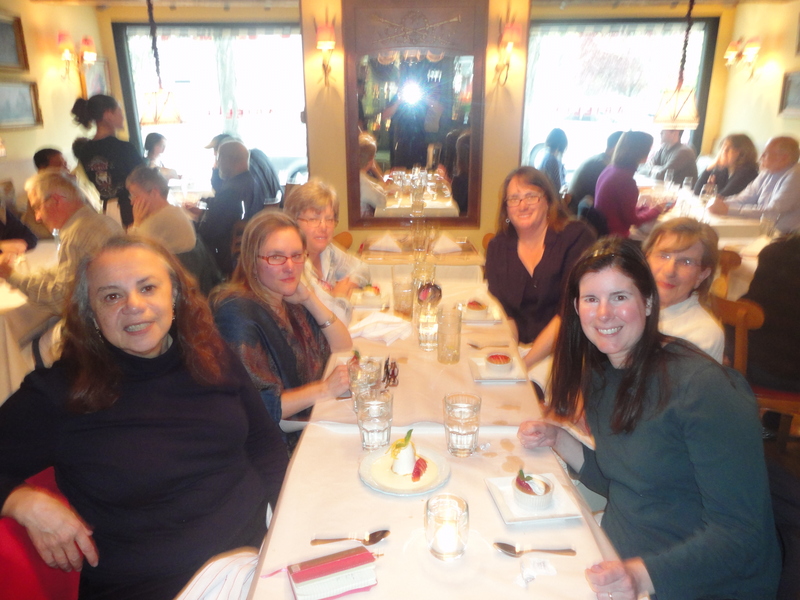 And I bet it really recharged your writerly batteries to have a reunion with Patti and the other writers. How fun! It really was nice. We didn’t plan ahead for the shows, so we were thrilled to find things we wanted to see, and to get tickets for them all! Sounds like a wonderful trip! Can’t wait to read your latest work! Thanks Jo! I think you’re going to have to wait a while for that , but I’ll keep you posted.